There is a big Do It Yourself movement right now. If you turn on HGTV, you likely won’t have to wait long for a DIY program. The book section at Home Depot is filled with DIY guides. The idea is that you’ll save money by doing a project yourself. The problem with this theory is that it doesn’t consider your time to be worth anything. Whether you’re working to earn income, socializing with friends or spending quality time with family, your time is valuable. 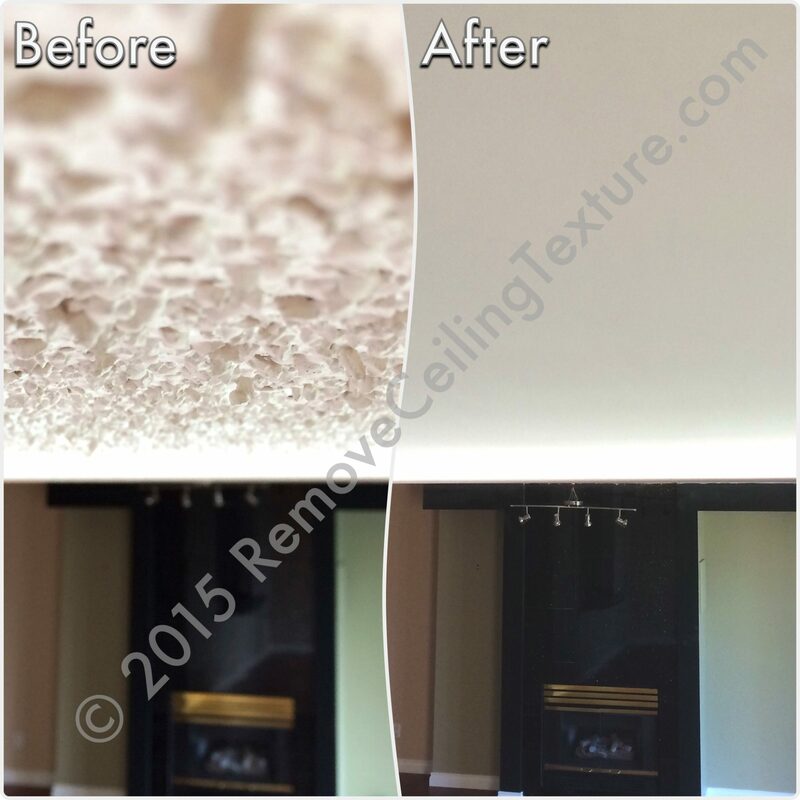 At RemoveCeilingTexture we’re often contacted by homeowners who have attempted to scrape off their popcorn ceiling texture. This is a messy, time-consuming process, but the real problem comes after the texture has been removed. There’s a reason texture is applied to ceilings. It’s to hide imperfections. Once the texture is removed, these deficiencies are obvious. The ceilings will still need to be finished by a professional. This is what DIY texture removal and ceiling smoothing looks like. Remove Ceiling Texture was called in to fix the mess. Smoothing ceilings is harder than it looks! This was a DIY attempt. This is after Remove Ceiling Texture was called in to professionally fix the DIY mess. Remove Ceiling Texture was able to fix the homeowner’s DIY disaster. Hiring a professional contractor offers several advantages over attempting a project yourself. Could someone off the street walk into your place of work and do your job? Not likely. Perhaps you have a degree or have taken relevant courses. You’ve had training and experience. You are a professional at what you do. In the same way, professional contractors have had training and they have experience. This is what they do every single day. They have know-how that can’t be taught in a 30-minute DIY show. What might take you several days or a week to get done, a professional contractor can accomplish in a day or so. There are a couple of reasons for this. First of all, the contractor doesn’t have to consult books or internet articles to make sure that he’s doing it the right way. As mentioned above, they have the knowledge and experience already. And second of all, this is their full time job. You have other things that need to get done. Maybe you work full time and can’t commit to the hours at a time that are often needed. You might have to drive kids to soccer games or piano lessons. When you’re constantly interrupted, it’s difficult to get much done at all. Just ask any mom with small kids! Many projects require specific tools. Unless your neighbour is Mike Holmes and he loves to lend you his tools, you’ll either have to rent or buy the tools necessary. And there’s a learning curve to many of these tools—it takes a few tries to get it right. A skilled professional knows the tools of his (or her!) trade like the back of his hand. The other problem with the saving money theory, is that often the project doesn’t get done the right way the first time. You could end up spending more time and money having to redo the work you’ve already done. A professional contractor does it right the first time. They also guarantee their work. If something does go wrong or doesn’t look quite right, they’ll come back and fix it. Their reputation is on the line, so perfection is important. A project that has been done DIY-style is often apparent to most people. Even if it was done fairly well, it usually doesn’t have the polished look that it will when done by a professional. So how should you go about hiring a professional contractor? Ask around. Friends, family or neighbours can be a good source of referrals. Not only can they tell you about the contractor’s performance, but you can see the work for yourself. Home building associations can also be useful. An internet search of the project you want done (for example: ceiling texture removal) should pull up a list of relevant contractors also. It’s also important to ask about workers’ compensation and insurance coverage. Every reputable contractor should have these basics. Feel free to ask for samples of work and references. If they are experienced professionals, they should have no problem providing you with this. A few quotes should be enough to make a decision. They should be in writing and state clearly what is included. There should also be an expected time frame. If the quotes are vastly different from each other, make sure each contractor understood the project completely. If something was missed on one quote, you won’t be able to compare them properly. While price is important, it shouldn’t be the only thing you consider. Think about your interaction with each contractor. Did you feel comfortable asking questions or were you made to feel stupid? Did they communicate well with you or did you have to drag answers out of them? Did they offer suggestions or were they not very familiar with the type of project? If you aren’t comfortable with your contractor, the cheapest price isn’t necessarily worth it in the long run. Once you’ve hired the contractor, the open communication should continue. The best way to avoid misunderstandings is to talk. If you have questions or concerns, don’t be afraid to voice them. Likewise, if something unexpected comes up that could change the scope of the project (as sometimes does with renovations and construction), your contractor should discuss it with you as soon as possible and give you options on how to solve the issue. You should always feel involved in the process and never forced into any decision—after all, it’s your house and your money. When the project is complete, inspect the work to make sure that you’re happy with it. If there is a problem, contact your contractor right away. They will be glad to fix it. Remember, contractors often work on referrals, so your satisfaction is important to them. Some people love puttering around the house, working on a project bit by bit for weeks on end. If this is you and you can live with less than perfect results, by all means, go the DIY route. But if you demand quality results and want things done properly the first time, hire a qualified professional—you won’t regret it. This DIY ceiling texture removal job left the ceilings uneven, patchy and full of ridges. The homeowner made a mess of smoothing his ceilings as he attempted to DIY. Remove Ceiling Texture cleaned up the DIY mess and the homeowners were left with perfectly smooth ceilings. The DIY ceiling smoothing attempt was professionally fixed by Remove Ceiling Texture. Did you attempt to DIY with your ceilings? Contact us today!